Just got this idea in my head for a logo and made it, but just didn't know where and how to place the name. So made few variations of it. 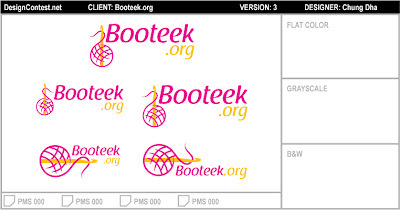 With the .org under the Booteek makes the its more compact and not too long. But I think just different way you can look at it. Some last one got full Booteek.org cause otherwise the .org would stick out underneath. I choose these colors cause in the other I saw these two colors works good when you got overlapping objects.This one got less about charity and more about the crochet workshop.